Hikari has a new painting in Ephemeral, opening this Saturday night at Modern Eden Gallery in San Francisco. 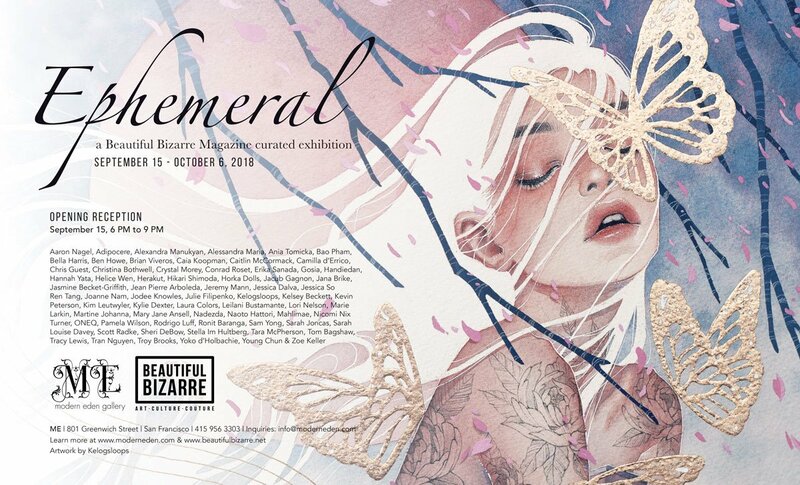 Crated by Beautiful Bizarre, over 60 artists from across the globe have been invited to create an original work considering the themes of fleeting beauty, impermanence, and the momentary expression of art and life. You can see the entire roster at the show's Facebook event here! For previews and purchase inquiries, please contact the gallery at i[email protected]. Almost everything in the universe and our lives is ephemeral or fleeting depending on the time frame, and lens that we look through. About her piece for the show, Hikari shares, "I wanted to paint a subject that has a strong and persistent existence despite being in a fragile state of disappearing. This is a piece where strength and transparent beauty coexist. The flowers attached to the figure's heart imply that "love is fragile."